This recipe was my beloved late mother-in-law’s always requested salad. It is deceptively easy and I still prepare it for my children and family. A few of the ingredients include radishes, green onions, celery and a bit of mayonnaise. Bring a large pot of lightly salted water to a boil. Add pasta and cook for 8 to 10 minutes or until al dente; rinse under cold water, and drain. 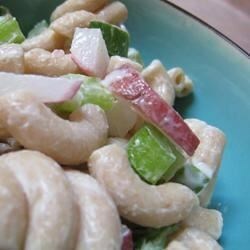 In a large bowl, combine the pasta, radishes, green onions, celery, mayonnaise, salt and pepper. Mix well, chill, and serve with sliced tomatoes.